Actualizado el 12 de febrero, 2019 - 10.08hs. PRINCETON JUNCTION, New Jersey, Feb. 12, 2019 /PRNewswire/ -- The International Card Manufacturers Association (ICMA), a global trade association for card manufacturers, personalizers, issuers and suppliers, will host its 2019 ICMA Card Manufacturing & Personalization EXPO March 31-April 3, 2019 at the Omni Orlando Resort at ChampionsGate in Florida in the United States. The EXPO is the world's only manufacturing-focused global card conference and exhibition designed to prepare attendees for the changing future of the card industry. With a focus on how the world transacts, the EXPO brings together pioneers and trendsetters from around the globe to provide attendees with a stand-alone, card-centric event. The event will showcase new ways to apply science, engineering, tools, methods and knowledge to develop next-level products and services that will launch the card industry into an era of innovation. With dedicated exhibition hours, featuring over 50 leading card industry suppliers, the EXPO will also include presentations on the latest trends and newest technologies as well as market forecasts. Topics will cover a wide variety of subjects such as biometrics, digital printing, metal cards, printed electronics, the greening of card manufacturing, inks, design and more. Bernard Baumohl, a chief global economist at The Economic Outlook Group will deliver the keynote address, "The Economic and Geopolitical Outlook: What are the Opportunities and Risks Ahead?" He will discuss international trade tensions and the global reverberations of the U.S.'s unprecedented economic growth. Baumohl has served as an economist at European American Bank and was an award-winning economics reporter with TIME magazine. With hundreds of entries from Europe, Asia, MEA and North America, the 2019 ICMA Élan Awards of Excellence winners will be announced. The awards celebrate the pinnacle of design innovation, security and technical achievements in the global card industry. Limited sponsorship and exhibition opportunities for the EXPO, which features more than 50 exhibitors, are available. For more information, visit icmaexpo.com. For nearly 30 years, ICMA has been a nonprofit association of card manufacturers, personalizers, suppliers and related industry participants. 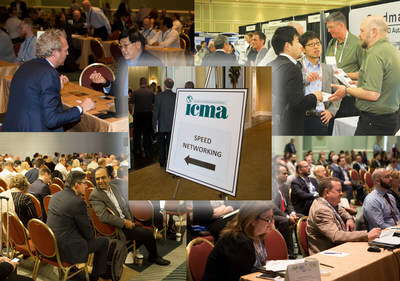 With 225 members globally, ICMA is a resource for industry issues, including the production, technology, application, security and environmental issues of cards. Visit icma.com.